in the following December returned home, having been discharged from a hospital August 21, 1863, he re-enlisted in Company I, Sixty-eighth New York, participating in the battles of Tunnel Hill, Buzzards Roost, Dalton, Kenesaw Mountain, Duck River, Franklin and Nashville. He participated in seventeen engagements and was wounded seven times. He lost an eye in a hand-to-hand encounter with a "Johnnie" at Deerhead Cove, Georgia, February 15, 1865, and although he was unconscious most of the time from February 15 until June 22, until an operation could be performed to remove the shattered bone, he had the satisfaction of knowing that he had got his man -- a guerilla who had been bushwhacking to the annoyance of the neighborhood. His regiment was sent to Fort Pulaski, on Tybee Island, Georgia, and remained there until November 30, 1865, then was sent to New York by water, and discharged in that city the eighteenth of December. On the evening of Mr. Walrath's return home he attended a party in the neighborhood, where none of his old companions knew him, and the young lady to whom he was engaged refused to dance or take any part in the merrymaking, as he had been reported killed and a funeral service had even been held for him. She had gone upstairs, where he found her, and asking her to honor him with her hand for a dance, was recognized, and she descended with him to the dancing floor, where she made merry as she had never done before. In time she became his wife, as she had promised before he went to war. After marriage Mr. Walrath again took up his trade at Ingham's Mills and later built a shop of his own, but owing to the severe strain on his remaining eye, in 1868 had to give up his trade. Procuring a light wagon, for several years he retailed meat around the country, and in 1874 opened a meat market at Little Falls, remaining there until he sold out and went west, as mentioned above. Mr. Walrath's marriage occurred January 6, 1866, to Miss Lena Kretser, who had waited three long years for his return from the army. She was born at Fulton, New York, a daughter of John Kretser, of French-Canadian parentage. Mrs. Walrath died at Atkinson, July 19, 1900, sincerely mourned by a large circle of friends. Four children were born of this union, of whom but one survives, Martin H.
Martin H. Walrath was born at Ingham's Mills, January 15, 1873, and has been associated in business with his father since attaining his majority. May 20, 1900, he married Miss Coila Uttley, of O'Neill, who has borne him four daughters: Lola, Helen, Maude and Thelma. Archibald Walrath is a republican in politics, since 1889 a member of the Ancient Order United Workmen, and a prominent member of the Grand Army of the Republic since its organization, having filled all the offices in the local post. Having a fine gift of oratory, he has often delivered all oration on Decoration Day in local celebrations, including the years 1888, 1892 and 1910. During the blizzard of January 12, 1888, he was getting ready to go to school for his boy, when the latter walked in, white as a marble statute, his clothing pastered with the icy dust. He had walked south from the school house to the railroad track, followed that to the fence which led to his father's gate, and thence felt his way along a row of trees until he reached the house. In early days when times were hard and fuel scarce, the family burned corn stalks and corn, the latter commodity being cheaper than coal. Deer and antelope were to be seen on the prairie when they first came and for several years afterward, and until the land had been broken prairie fires were frequent and they had to fight them, as did the other settlers. He has had a long and busy life, but notwithstanding his weight of years is as light of step and full of vim as most men one-fourth his age, and gives promise of attaining at least the long span of years which were granted to many of his ancestors. He is well known in his community as a public- spirited citizen and all able and reliable business man. Arthur Browder, a native-born Nebraskan, being born in Boone county, is the only son of Albert B. and Albina E. Browder. A sketch of the former appears in this volume, while the latter departed this life October 6, 1905. The family is among the prominent pioneers of Boone county. Mr. Browder was born on the homestead farm in Boone county, on April 27, 1874, and has the distinction of being one of the first white children born in the county, his parents having settled here in 1872, and his birthplace was one of the first frame houses erected on a farm in Boone county. He grew up on the home place, and in his fifteenth year came to Albion with his parents, receiving his education in the common schools, finishing with a business course in a commercial college in Omaha in 1892. Upon returning home from school, he associated himself with his father in the hardware business, continuing the work up to 1899, then disposed of his interests and moved to Council Bluffs, Iowa, where he carried on the same line of work for two years. He returned to Albion about 1901 and again embarked in the hardware business, which he has operated successfully since that time. He has met with success, and is now classed among the prominent younger business men of his town, enjoying an extensive patronage, and having one of the best equipped stores in that part of the state, carrying a large and complete up-to-date stock of goods. Mr. Browder was married to Miss Maude McDaniel, at the home of her parents, in Albion, Nebraska, on December 31, 1896. Mrs. Browder is a native of Missouri, and the youngest of two children, her parents now residing at Boulder, Colo. Mr. and Mrs. Browder had one child, a son, which died at the age of four years. They have a pleasant and comfortable home in Albion, and enjoy the friendship of a large circle of people. F. Meierhenry, who came to Nebraska twenty-seven years ago, now owns a very comfortable home on section thirty-five, township twenty-five, range one, Wayne county, where he has developed a fine farm. He has always interested himself in whatever movements were on foot for the advancement and welfare of his community and the betterment of conditions in the county or state. Mr. Meierhenry was born at Lippe Detmold, Germany, in 1866, and is a son of Herman and Lizzie Meierhenry, natives of that country, who were parents of eight children. He received a common school education in his native place, and was reared to habits of industry and thrift. In 1884, he left home for America, sailing from Bremen to New York on the steamship "Elbert." He came direct to Washington county, Nebraska, rented land six years, and then secured a place of his own. He came to Wayne county in 1898 and secured his present home. This place was slightly improved, and he has in many ways beautified it and added to its value. He has a fine orchard and grove of about four acres, and his land is well tilled and productive. In 1893, Mr. Meierhenry was united in marriage with Miss Amelia Maas, and nine children have blessed this union, as follows: Oscar, August, Elza, Donald, deceased, Erreg, Albert, Louis, Edwin, and Adelia. Mrs. Meierhenry, who was born in Wayne county, is a daughter of Carl Maas, was reared here. Mr. Meierhenry is a progressive and useful citizen, esteemed as a man of upright honesty and integrity, and has a wide circle of friends. A typical pioneer of Nebraska is represented by the gentleman above named, Louis Belz, who has lived for many years in this section of the country, and the story of whose life and experiences has become virtually a part of the history of the development and growth of this region. He has built up for himself a comfortable home, has amassed a fortune by his perseverance and thrift, and has come to be regarded as one of the foremost citizens of Stanton county. Mr. Belz was born in Pummon, Germany. April 6, 1832, and is the son of Fred and Katherine Belz, his father being a small farmer of the community. Mr. Belz spent his childhood years in Germany, and received his education in the German schools. He was also married there in 1857, to Miss Wilhelmina Zilmer. In 1857, the family left their native land for America, sailing from Hamberg to Quebec, the little sailing vessel taking eleven weeks for the trip. They came at once to Wisconsin, where they remained until 1866. Wishing to enjoy fully the opportunities afforded the pioneer, they came to Stanton county, Nebraska, traveling by means of a yoke of oxen, the trip from Wisconsin to Stanton county taking seven weeks, with these slow-going beasts. Mr. Belz here took up a homestead and built a sod house in which he lived a number of years. Later, a log house was erected, the lumber being hauled from Fremont to build it. Here our subscriber and his family worked and toiled for years, meeting numerous discouragements at first. They lost their crops several times, owing to the ravages of the grasshoppers, and were more than once compelled to fight prairie fires in order to keep their homes from being destroyed. Their fortunes gradually changed for the better, and now our subject enjoys the comforts of a beautiful home, very pleasantly located in section twenty-four, and is the owner of a well-equipped farm. He is one of the leading citizens of the community and enjoys the respect and esteem of all with whom he has come in contact. Mr. and Mrs. Belz are the parents of four children: Lena, Mrs. Gustav Krenzien; Frank, Paul, and Ida, now Mrs. Herman Sidell. Charles W. Smith, proprietor of one of the most valuable estates in Antelope county, Nebraska., has been a resident of that locality since 1879. He is known throughout the northeastern part of the state as one of the foremost farmers and stockmen in Nebraska, and after many years' hard labor in accumulating a fine estate, is now prepared to enjoy the remaining years of his life in peace and comfort. He still looks after his farm and business, not being content, to settle down in idleness, though the burden of carrying on hard labor has been transferred to younger shoulders. cabin boy in a sailboat bound for America. His early youth was spent as a sailor with all the hardships that life implies. When only twelve years of age the ship in which he was sailing was wrecked on a coral bank in the West Indies and they were swept overboard to drift helplessly, without food or water, from nine o'clock Tuesday afternoon until midnight the following Saturday, when a party of wreckers on an island succeeded in reaching the drifting boats and brought succor to the famishing castaways. Mr. Smith followed the sea for ten years, and at the age of eighteen became a landsman again, working until 1861 on the docks at New Orleans, loading cotton on vessels plying out of that port. At the outbreak of the war in order to avoid service under the confederate colors, he made his way to Mobile whence he shipped to Cuba, sailing from Havana to New York. Learning that his old friend, the sea captain, was in Maine he proceeded there for a short visit, then migrated west by way of Chicago, going, on from there to Omaha, which at that time was the end of the railroad. He worked his way to the mountains as a member of a freighting outfit, spending some time in the various mines throughout "the mountains" as all the region embraced in Wyoming, Utah and Colorado, was called, finding employment until the building of the Union Pacific Railroad, which made freighting less strenuous than formerly. A friend and companion in the work with him desired to return east to see his family, and he persuaded Mr. Smith to accompany him, thus changing the whole course of his life. He settled in Harrison county, Iowa, engaged in farming until the spring of 1879, at which time he started by wagon train for Nebraska, locating in Antelope county. He immediately took up a claim of one hundred and sixty acres in southeast quarter, section thirty-two, township twenty-seven, range five, built a sod house and lived in that one year, then erected a good frame house, which was one of the best in that section of the country, hauling the lumber from Niobrara. He later built an addition on this dwelling, and still occupies it. On March 7, 1872, Mr. Smith was married in Iowa to Miss Ann Johnston, whose ancestors came originally from the hills of Scotland. They are the parents of five children, whose names are as follows: Linzza W., who married Avah Armstrong, and has seven children; Dean B., who married Clara Sheets, they are the parents of five children; Ralph, whose wife is Miss Anna Hein, they having two children, while Clare holds the position of freight and baggage agent for the Southern Pacific railway company at Cottage Grove Oregon, and Ruth, the youngest child and only daughter, lives at home. Mrs. Smith passed away on November 13, 1901, deeply mourned by all her family and a wide circle of friends. Mr. Smith and his family enjoy the regard and esteem of a large number of friends and acquaintances, and owns a beautiful home, consisting of five hundred and sixty acres of land. This place is plentifully supplied with fine groves surrounding each tract, including a splendid four-acre walnut grove, which is considered the finest in that part of the country and is one of the chief attractions of the estate. Mr. Smith is a democrat, in politics. At the time of the memorable blizzard of January 12, 1888, three of our subjects children were at school and all of his stock out in the open fields. The eldest son managed to make his way through the fierce storm to the homestead, telling his parents that the two others were to remain at the schoolhouse, for the night, but the father, knowing they would suffer from hunger, started after them, losing his way three times during the trip between his own gate leading to the road and the house, a distance of less than fifteen rods, but finally got the youngsters safely home. As for the cattle and other stock, they found their way to the sheds of their own accord, and none were lost. It is quite a change from a comfortable, luxurious home in an old-established country to one in the prairie wilderness of a new world, where recently the Indian and the wild animals held full sway, and few coming from such a home can endure the privations of the pioneer and remain long enough to reap the reward which can be won from the wilderness. 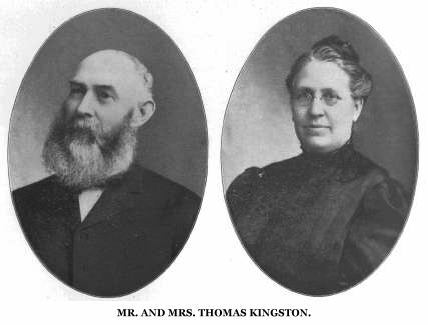 Of such, however, are Mr. and Mrs. Thomas Kingston, of Staunton. They are natives of Ireland, and from childhood, enjoyed the comforts of a home of plenty, as the parents of both were prosperous, well-to-do people. Mr. Kingston was born November 24, 1851 about forty miles from Cork, near the little village of Glandore, a summer resort by the sea. His father, James Kingston, was a prosperous stockman and dairy farmer, owning his own land, and at his death, Thomas' share of the estate was a small farm and eight hundred pounds sterling quite a fortune for a young man just starting out in life. feet of water in the hold and the crew almost exhausted at the pumps. Boats were lowered and the unfortunates were taken on board the "Greece," making a load of about thirteen hundred for the old vessel. The French captain declared the vessel abandoned, and the captain of "The Greece" put a small prize crew aboard it to try to get it into port for salvage. Through some blunder in getting away from the abandoned vessel, the two collided and "The Greece" had a large hole torn in her stern, and at first it looked as if both rescuers and rescued were again in grave peril. However, the hole was patched up, and after eighteen days buffeting with the waves, the disabled vessel reached New York, after having been reported lost. Mr. and Mrs. Kingston came to Omaha, and from there direct to Stanton county, where he purchased a half section of railroad land eighteen miles from Wisner. When Mr. Kingston settled on it, he paid down all his ready cash, expecting to make enough on his first crop to meet the payments as they fell due. Unfortunately, the grasshoppers invaded the country just at this particular time, and for four years Mr. Kingston had considerable difficulty in providing for the wants of his family. He was not able to meet his payments and so lost the land and all be paid on it. When his fortune turned, Mr. Kingston re-purchased the entire half section. The land he originally bought at four dollars per acre cost eight dollars on re-purchase, and the last forty acres cost fourteen dollars per acre, which shows how quickly values rose. He began to give all his attention to stockraising, and so added to his land, that when he retired, in 1906, he was the owner of over a thousand acres of as fine land as there is in the west. Three hundred acres was under cultivation and even this failed to provide enough feed for his stock. On coming to Stanton, Mr. Kingston purchased a small house, added to it and thoroughly remodeled it, so that now it is a most comfortable home with all modern conveniences. Three children have been born to Mr. and Mrs. Kingston, and all are living. Sarah, married J. A. Brown of Stanton; Mary E., is the wife of L. L. Way, an automobile dealer of Wayne; and James Richard has for some time occupied the old home ranch. In every way, Mr. and Mrs. Kingston have proved themselves true pioneers. They suffered gallantly and uncomplainingly the hardships of the early settler's life, and are now enjoying their rewards. Their religous training has been in the faith as expounded by the church of England, the true Episcopalian. Mr. Kingston is a member of the board of county commissioners, and the influence of his progress is apparent in many public enterprises. We are pleased to present portraits of Mr. and Mrs. Kingston elsewhere in this work. Mr. and Mrs. Thomas Kingston. Edwin D. Pulcifer, residing on the north half of the northeast quarter of section one, township twenty-seven, range four, Pierce county, Nebraska, is regarded as one of the leading citizens of his locality. He has always been one of the important factors in the upbuilding of his region, aiding in its development and growth from the time of its earliest settlement. Edwin D. Pulcifer was born in Syracuse, New York, May 29, 1851, and lived there until 1862. His mother died in 1859, and about three years later the boy and a sister went to Wisconsin and made their home with relatives. In 1864 Mr. Pulcifer went to Jasper county, Iowa, reaching his destination the night before Lincoln's second election. In 1869 he went to Marion county, Iowa, where he worked on a farm, and in 1875 he went to Dallas county, Iowa, where he married. and resided until 1882. In that year Mr. and Mrs. Pulcifer moved on the homestead where they now reside. For five years they lived in a primitive sod house, and then moved into the present frame house, situated in a fine grove of trees planted by Mr. Pulcifer. The grove and orchard cover seven acres. In the blizzard of January 12, 1888, Mr. Pulcifer was two and one-half miles northwest of home. The mare he was riding found the way home -- on foot he could not have found the way. The higher grasses between tracks helped keep directions. Several wayfarers found shelter, in his house over night. A notable storm he experienced was known as the dark day. A yellow haze made it too dark to see anything, and hail and mud fell thickly, covering foliage and herbage. In the early days, hay and cornstalks were sometimes used for fuel. Mr. Pulcifer was married to Miss Allie Holly in 1875, and they have a fine family of ten children, who are named as follows: Bertha, Dora, Lillie, Marian, Charles, Ellen, Fay, Orville, Elmer and Mary. Six of the above named children have claims of their own, and five of them are married and have families. Charles was educated in Aurora, Nebraska, and Lillie in Lincoln. Mr. Pulcifer is affiliated with the Independent Order of Odd Fellows, and is highly respected by all in his community. He served, his county as precinct assessor for fourteen years, and although a prohibitionist and of the weaker political party of the county, he has been elected by a comfortable majority to the office of county assessor. hardship and privation in order to secure a competence for his old age, now being in an independent position financially. To his friends he recounts many interesting experiences of the pioneers days in central Nebraska. Mr. Nielsen was born in Howard county on April 28, 1873. He is a son of Niels and Maria Nielsen, who settled in Nebraska in 1872, during their early married life. Our subject was reared in his native county, attended the district schools as a boy, and later spent two years at the Western Normal College in Lincoln, Nebraska. He left that institution in 1894, returning to his father's farm where he remained for two years then started farming on his own account on rented land. In December of 1898 he purchased one hundred and sixty acres on section thirty, township fourteen, range twelve, which was a well improved tract, and operated this successfully for the following five years, when, owing to poor health he was obliged to give up active farm work, so secured the appointment as rural free delivery carrier on route number one, which he kept up for over two years. Mr. Nielsen moved his family to Boelus shortly after securing his appointment. In the meantime he had purchased some residence property in Boelus, upon which he erected a fine home. Since his retirement from the mail service he has been engaged in different lines of work here. He is owner of one hundred and sixty acres situated on section six, township twelve, range twelve, Hall county, Nebraska, which he purchased in the fall of 1906. This he farms himself -- his Howard county farm being rented and derives a good income from the same. He is a thorough business man, and considered one of the substantial citizens of his locality. Mr. Nielsen is active in local affairs. He is a populist, and has held various township offices, serving as assessor during 1900, also as road supervisor for one year. For four years he was director of school district number sixty-six, and in 1906 was elected city clerk of Boelus, which office he filled up to 1909. He is a prominent member of the Danish Brotherhood, and was secretary of Lodge 165, for a period of three years, in 1906 being elected as a delegate to the National Convention of the D. B. S. which was held at Council Bluffs, Iowa. Mr. Nielsen was married February 19, 1898 his wife's maiden name being Wilhelmina Sorensen, born in Michigan and reared in Howard county, where her parents were early settlers. Two children have blessed their union, Johannes and Valentina, both of whom are bright and sturdy young people. They have a pleasant and happy home, and enjoy the society of many friends. During 1908 Mr. Nielsen took his family for an extended trip through California, spending three months in travel, which was greatly enjoyed by all. James A. Ollis, one of the leading citizens and agriculturists of Valley county, Nebraska, is well known as a man of sterling qualities and true public spirit. He is an old settler of this locality, having come to Valley county some twenty-eight years ago, and through the years has given generously of his energies and unceasing work for the upbuilding of his home state and county. James A. Ollis, junior, son of James A. and Martha (Brown) Ollis, was born in Hancock county, Illinois, October 12, 1859. He is second in a family of five children, and has one sister residing in Texas, and another in Valley county, Nebraska; the other children are deceased. Mr. Ollis' parents reside in Ord, Nebraska, where they are well known and have a host of good friends. Mr. Ollis received good educational advantages, and after teaching in Illinois schools for several years engaged in farming. In 1882 he came to Valley county, Nebraska, homesteading one hundred and sixty acres of land in Mira valley, living there for two years. In 1884 he purchased what has since been his home place which is located in section sixteen, township eighteen, range fourteen. This is a finely improved and well-equipped stock farm, and Mr. Ollis makes specialty of breeding thoroughbred horses. On November 5, 1880, in Illinois state, Mr. Ollis was united in marriage to Miss Sarah Kerr, which union was blessed with eight children, namely: Sarah E., wife of E. C. Armstrong, has two children, and resides in Valley county; Alice M., Elmer K., Nellie M., William M., Ethel M., Ruth E., and James B., all of whom reside at home. Mrs. Ollis died on the home farm in October of 1896, survived by her husband and children. In 1885 Mr. Ollis was elected county commissioner, and has also served as director of school district number nine for twelve years. In 1900 Mr. Ollis was made a member of the Nebraska house of representatives; and in 1908 was elected to the state senate, representing district number fifteen; and was again elected for the senate for the term of 1910. He served as member of the state board of agriculture for five years and on the board of managers during 1911. On August 4, 1905, Mr. Ollis was married to Mrs. Eliza E. Knott who was born in Ohio. Mr. and Mrs. Ollis are surrounded in their home by many good friends and enjoy a wide acquaintance. Mr. Ollis is one of the younger pioneers of his county, and through the years has been closely identified with its interests. He is a progressive man of affairs, prosperous and successful, and owns twelve hundred eighty acres of land, all in Mira valley. phone in Valley county. He is a Presbyterian, a democrat in politics and a member of the American Order of Protection, the Modern Woodmen of America, the Ancient Order of United Workmen, and the Independent Order of Odd Fellows, and with Mrs. Ollis of the Rebekahs, an auxiliary degree of the Independent Order of Odd Fellows. William Preusker, residing in township twenty-four, range two, Madison county, Nebraska, is proprietor of a well developed and valuable farm in section twenty-eight, which he has operated successfully for the past eighteen years or more. He is one of the substantial citizens of his locality, and is held in the highest esteem by all who know him. Mr. Preusker grew to manhood in his native country, receiving the usual schooling, and there he lived until he reached the age of thirty-five years. In 1892 he left his native land for America, embarking at Hamburg on the steamship "Bismark," and was seven days on the sea. After landing in New York, Mr. Preusker went direct to Nebraska, where he bought the farm known as the Fleming homestead, which he has steadily improved and now has a good home and valuable property; he has had pretty fair sailing since coming to Nebraska, but in the year 1894 he lost all the season's crops during the terrible drouth that caused the scorching winds which swept over the land, burning everything to a crisp. Mr. Preusker was united in marriage January 4, 1880, to Miss Anna Middelstead, who is a native of Russia, and a daughter of Julius and Thorena Middlestead. Mr. and Mrs. Preusker are the parents of seven children, whose names are as follows: Adolph, Amelia, Gust, Hulda, Fred, William and Lydia. They are a fine family and in their pleasant home are surrounded by a host of good friends and neighbors. Although not of the very oldest settlers, Mr. Preusker has in his eighteen years' or more residence in Madison county proven himself to be of good worth and industrious, and he is highly esteemed by all in his community. He is a member of the Lutheran church, and a democrat. The late James Pierce was one of the best known men of Custer county, and the head of a large family. He was born in Charlestown, Massachusetts, July 4, 1824, a direct descendant of Thomas Pierce, a native of England, who came to America in 1634 and settled in Charleston. Thomas Pierce was the father of seven children, one of whom founded a family in Charlestown, and the family continued to live there for many generations. The grandfather of the subject was a soldier of distinction in the revolutionary war. He captured the first British prisoner that was taken by the Americans. He was lieutenant in the militia and was drilling his company on the green at the time the opposing army appeared for battle at Lexington, and was in the thickest of the fight. His wife stood in the doorway of their home and watched the proceedings. James Pierce was educated in the public schools of his native city, and at the age of fourteen years went to Illinois with his father, The father died there after a short illness and the boy was left to make his way home alone, which he did by going down the Mississippi river by boat to New Orleans, then taking a sailing vessel up the coast to Boston. After his return he worked for a time as a clerk, then shipped on board a whaler for a cruise of four years on the Pacific ocean. He followed the sea fourteen years, beginning as a boy and eventually becoming first mate. He thus visited the principal seaport towns of South America. After leaving the whaling service he shipped as first mate of the "Wellfleet," a large merchant vessel which sailed between New Orleans and Liverpool. In 1855, Mr. Pierce married Jane Hunt and they lived in Charlestown for a time, and moved to Mower county, Minnesota, in 1857. He secured a farm there and for several years hauled his crops to market on the Mississippi river, ninety miles distant. In 1864 he enlisted in the union army and served until the close of the war. He returned to Minnesota at the close of his term of service and carried on farming during the summer and taught school winters. In the summer of 1880, he went via the prairie schooner route, to Custer county, Nebraska, and in August of that year took up a homestead on section thirty-one, township nineteen, range eighteen, which was his home until his death, March 11, 1910. This farm is located in the beautiful little valley of Sommerford, and for twenty-six years Mr. Pierce served as postmaster of the office at Somerford. In the fall of 1881 he taught in one of the first schools of Dry Valley, and in the following summer helped organize school district number thirty-five, which has since been divided into six districts. the dry years and the years of panic and came to enjoy the respect and esteem of all who knew them. Of their eight children, seven now survive: Frances W., Mrs. Orvel Story, deceased, she was the mother of three children and resided during her life in Somerford Valley; George G., on the home farm; Thomas L., of Custer county; A. W., on section six, township eighteen, range eighteen; William A., of Sargent; Elizabeth, wife of John Knight; Henry O., owner of the home farm; Jesse, living north of the home farm. Several of these children are mentioned elsewhere in this work. Mr. Pierce was an honored member of Crittenden post number two hundred and seventy-four, Department of Nebraska, Grand Army of the Republic, and at the time of his death the organization passed resolutions of condolence to his sorrowing family. Among the prosperous citizens of Cedar county may be mentioned the above, who is also one of the older settlers, having come to this locality in 1880. Mr. Harris is now the owner of a valuable farm in section sixteen, township thirty-one, range two, which has been his continuous residence since coming to the county. Mr. Harris is a native of Ohio, and was born in 1848, the son of William and Lidia Harris. His boyhood years were spent in Iowa and when the civil war broke out, he enlisted at the beginning under Captain Kettridge, Company F, Seventh Iowa Infantry. He was in many engagements during the war and also took part in the celebrated march to the sea, under Sherman. His father was also in many battles, and died during the progress of the war. Mr. Harris was mustered out in 1865, but later on joined the regular army again, this time going to Fort Sully, South Dakota. While in South Dakota, Mr. Harris took up a homestead in Baum county. Here he built a log house and lived until 1873, when he moved to Butler county, South Dakota. Mr. Harris and his little family lived at this place until 1880, when they came to Cedar county. Here Mr. Harris bought his farm, and it has been his home ever since. During the early years of the settlement, both of Nebraska and South Dakota, Mr. Harris nobly played his part in the development of the country. The settler's life during those days was not all sunshine, either. For several years he lost almost everything because of the grasshoppers, the plague of that time, and many times was compelled to fight for hours against prairie fires, in order to save his home from destruction. At one time he lost over forty head of cattle in a blizzard, almost all he had, in fact. However, in spite of adversity, he persevered and is now regarded as one of the most prosperous stockmen of the vicinity. In 1870, Mr. Harris was married to Miss Mary Goodman, and to them have been born four children, named as follows: Lydia, Luella, Minnie and Henry. Among the progressive and energetic pioneers of Merrick county, Nebraska, who have contributed largely to the prosperity enjoyed in that vicinity, a high station is accorded this gentleman. Eugene Hilton was born in Augusta, Maine, February 8, 1844, and was the fourth of seven children in the family of John and Mary (Ingham) Hilton, who had two sons and four daughters born to them. The parents, John and Mary Hilton, two sons, Charles and Eugene, and daughters Fannie and Annie, came to Nebraska in 1858, having left Maine in the spring of 1857, going to Iowa, and in April, 1858, came on to Nebraska. One daughter, Nellie, remained in Augusta, Maine. The other two daughters, Mary Helena and Emily, died in Maine before the family started west. The Hilton family came overland by team the entire distance to Nebraska, locating on the Elkhorn river in the eastern part of the state, Where the father, John Hilton, took up a pre-emption claim, proving up on same in 1859. Here the family lived until 1862. John Hilton, head of the family, died in the fall of 1859, and in December of the same year, Mrs. John Hilton, with her son Eugene and daughters Fannie and Annie, came to the Lone Tree station on the Northwestern stage and mail route, located on the Platte river, about three miles southwest of what is now Central City. This station had been established a year or so prior to this time. The Hilton family came here to take charge of this station for the stage company. Lone Tree station, got its name from a large cottonwood tree which stood an the banks of the Platte river; a lone tree standing by itself with no timber closer than forty rods, notable for its size and almost perfect proportions. The Hilton ranch was located one mile east of Lone tree station, and earlier had been taken up by Henry Rowell, who had married a half-sister of the Hiltons. The Hiltons took up their residence on this ranch in 1863. Mrs. Mary Hilton died June, 1886. Charles Hilton, the son, who came to Nebraska with the family, later went to New Mexico and became a cattle ranch owner. He died in New Mexico.